Fillenium Malcon Easy Print Remix #3DThursday #3DPrinting « Adafruit Industries – Makers, hackers, artists, designers and engineers! Yet another remix of the iconic spaceship from Star Wars. This one is split and oriented for easy printing, with each half resting securely on the bed. Alignment pegs ensure everything is positioned perfectly during assembly. All pieces print with NO support, NO raft, NO brim, NO infill. 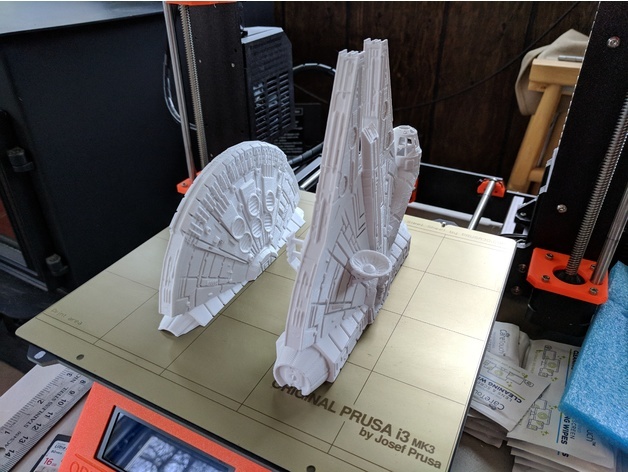 Printing at normal size yields a model with overall dimensions of about 131mm wide by 191mm long. Scaling up to 155% makes the front half around 191mm tall on the bed, for a completed size of 207mm wide by 297mm long. The last few photos show a quick test I made to check fitting of the pegs. UPDATE: I have uploaded an alternative version, this time sliced into 3 pieces. The rear section (the part that prints upside down) is about as small as I dared to make it without sacrificing too much stability for the middle section. Middle and front sections will require some minimal infill (5% suggested) as there are internal structures to be supported. Rear section should not need any infill. You should also print four of the alignment pegs. I have not printed the 3 piece version yet, let me know if you discover any problems.